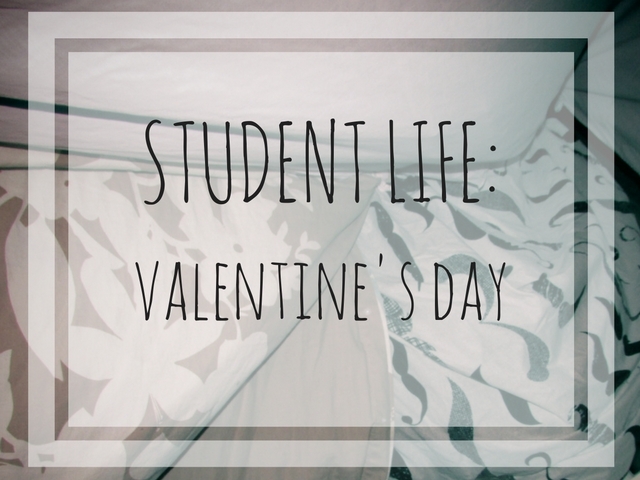 There are still a fair few other singles out there I can grab for a night in on V-Day 'cos students will use any excuse to celebrate, whether it's celebrating out with a few drinks, or staying in with a pizza. Staying in with a pizza is always my choice. I'm going to pitch the idea of a pizza and horror movies night on V-Day with some of my single mates, I doubt they'll say no. Last year I was more into drinking, like most first years (I don't know what happens but the transition to second year makes you an old hermit usually) and with my other single housemate, we went to our single friends' for some single fun in a blanket fort!! We look so happy and not drunk at all. That's me in the middle, my pose is "peeking over the imaginary wall between single life and couple life and crying softly". I say that but I actually prefer single life, I think, I haven't tried couple life at uni but I don't really plan to. Unless I get swept off my feet by my dream man (hilarious, feminist, good cook, total weirdo - send applications to the email in my bio please). I love making a big deal of Valentine's Day, there are so many things you can do whether you're single or not! And it really doesn't have to be expensive. Even if I wasn't single I'm pretty sure I would suggest pizza and horror movies for V-Day. I hate how commercialised it is, which I've said before, but I am trying to stay away from ranting about that and instead just celebrate it my way! What do you think of Valentine's Day? An excuse to celebrate? Love how tacky it is? Or total snooze-fest and you ignore it? I like hearing how different people celebrate different holidays, if at all! I think Valentines day is the perfect opportunity to do something you wouldn't normally do, be it with friends or your boyfriend. While I'll be going out with my boyfriend for dinner, I'd probably advise friends to go for dinner or have a picnic or something! I was never a huge V Day fan, Couples should show their love for each other everyday, not just one day in a year!